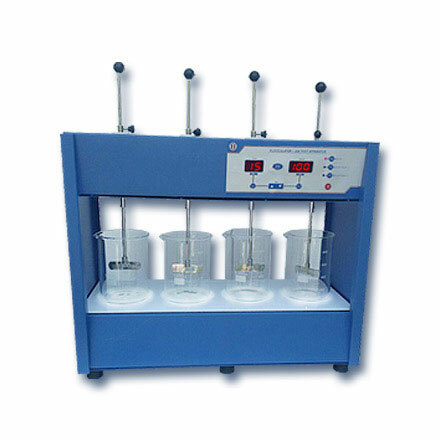 Flocculator/Jar Test Apparatus | products Categories | Electronics India - Manufacturer, Supplier and Exporter of Analytical, Scientific Laboratory and Pharmaceautical Instruments in India. Electronics India is renowned as a important manufacturer and supplier of hi-tech instruments used in the pharmaceutical industries, institutions and research laboratories. We are considered Flocculator/Jar Test Apparatus is a flocculation (jar) tests on water and effluent samples. A digital display clearly indicates the speed of the rotational stainless steel paddles, which can be varied from 25 to 250rpm. The digital timer can be set to count down from 1 to 99 minutes. After count down, the paddles stop and an alert sounds. The timer then counts up in minutes in order to measure settling time. Two pre-set programs allow routine speed and time parameters to be input and then selected by simply pressing one button. Parameters are stored in the memory and can be recalled or altered at any time. The intuitive touch sensitive keypad is totally flat for easy cleaning. It is supplied with stainless steel paddles with adjustable spaces to adjust the depth of the paddles. RPM measurement arrangement is provided.